Fifteen years ago, Argentina’s government stopped its reliance upon the International Monetary Fund (IMF). The argument made was that the IMF had weakened Argentina’s ability to create its own policies based on its own needs. In May 2018, Argentina’s government–led by Mauricio Macri–could not control the peso’s exchange rate against the dollar. Macri went back to the IMF. Negotiations with the IMF deepened Argentina’s crisis. Between May and October, the peso was devalued by 100%. Inflation accelerated and the rate of price increased, surpassing the previous record set in 2001-02–when Argentina’s economy and political order went into a tailspin. Argentina’s inflation rate for 2018 (between 40% and 50%) is not near the rate in 1991 (84%), after which Argentina pegged the peso to the dollar (a practice that lasted till the crisis of 2001-02). Nevertheless, the Macri government is using the current situation to adopt policies that were implemented when the situation was far graver. Economic activity did plummet after May 2018. The recession did deepen. Poverty did increase and so did unemployment, as workers found themselves with increasingly precarious work arrangements. The government did what all neo-liberal governments do: it cut public spending, particularly in the areas of education and health as well as in publicly owned companies. Argentina plunged into the depths of a new economic and social crisis. But rather than find solutions to this crisis, the right-wing government adopted a recipe from the IMF to draw the country deeper into cascading neo-liberal crises. In June, Macri and the IMF reached a Stand-By Arrangement. A Stand-By Arrangement–which the IMF first devised in 1952–allows the Fund to provide financial aid to an ailing country in return for ‘reforms’ that would return the country to financial sustainability. Between June and September 2018, the Fund’s financial aid entered Argentina with two Stand-By Arrangements. The crisis deepened. Macri’s ‘reforms’ included the elimination of the fiscal deficit, cuts to the Ministry of Health and Work and an end to the further printing of the peso. Macri’s solutions to the crisis further engendered the crisis. This is a characteristic of neo-liberalism, a policy framework that is not a solution to a crisis, but a creator of crises on the backs of earlier crises. The crisis was not only limited to the economy. It also had an impact on Argentina’s political order–reshaping state institutions and democratic mechanisms as well as increasing the possibility of a variety of forms of social and political unrest. 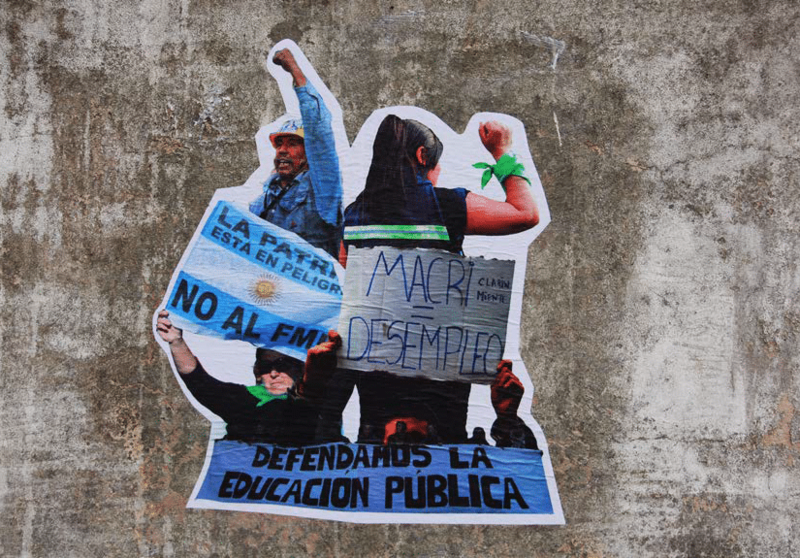 This dossier by Tricontinental: Institute for Social Research reflects on the different dimensions of the crisis in Argentina. In December 2016, Mauricio Macri was sworn into office. Macri was the candidate of a centre-right electoral coalition–Cambiemos(‘Let’s Change’). He defeated the candidate of the Frente Para La Victoria (‘Front for Victory’), which carried forward the agenda of the twelve-year governance of Néstor Kirchner (2003-2007) and Cristina Fernández de Kirchner (2007-2015). Cambiemos benefitted from a combination of domestic crises and a changed international situation. Domestically, the welfare policies of Kirchner’s government began to flounder as commodity prices collapsed and as vulture capital began to dig past the protections set up by the government. It helped that Latin America was in the midst of a right-ward turn. 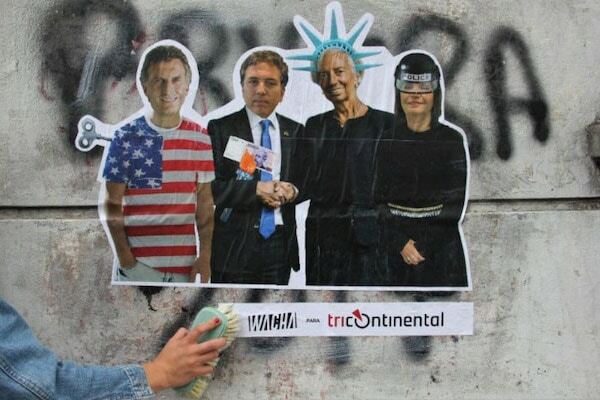 The multimedia houses intensified their use of their monopoly over television and radio as well as their innovative use of social media networks (including the use of Cambridge Analytics in Macri’s 2015 campaign) to go after Kirchner in a most hostile way. Cambiemos did not come to power on the back of a military tank; it came to power–strikingly–through a democratic election. Once elected, Macri, the candidate of big business, brought in people who had close ties to world of business. This government is, as Claudio Katz put it, a ‘CEO-cracy’ (Katz, 2015). Macri blamed all the ills in Argentina on the previous administrations–on the Kirchners and their progressive agenda. They wanted to bury the progressive agenda–the universal payment per child programme, the investment in public works, the protection for domestic workers, and the legalisation of two million migrants. The recession of 2016–which Cambiemos used to attack Kirchnerism–did produce a drastic decrease in purchasing power (by 6%). Inflation rose by 40.3%, and it was this inflation–rather than other factors–that was blamed for the rise of inequality, poverty and unemployment. Having said that it was the Kirchners who had destroyed Argentina, against all evidence, Macri’s government now turned to its neo-liberal agenda of tax reform for big capital and of payment to transnational speculative funds that had bought Argentina’s debt. Tax relief for the wealthy and the payment to the speculators came from an increase in Argentina’s external debt. Hastily, the Macri government deepened extraction activities–including intensifying extraction in unconventional areas such as fracking from Vaca Muerta (a geological formation in Neuquén). Cambiemos’ CEO-cracy benefitted the titans of finance, energy, agro-business and the media. In October 2017, the Argentinian people went to the polls to elect a new parliament. The multimedia monopoly firms went on an aggressive campaign to define Macri and Cambiemos as uncorrupted, while they described Kirchner and her front–Justicialista–as corrupt. Just before this parliamentary election, Macri increased public spending. The temporary boost helped his party–Cambiemos–win. As soon as the new parliament took its chairs, Macri proposed cuts to social spending and IMF-style reforms of labour and electoral law as well as tax and pension policies. Resistance to these measures prevented all of them from passage. The one that did go through–pension reform–passed in December 2017 despite mass mobilisations around the parliamentary building that were met with fierce police repression. International financial agencies warned about Argentina’s growing external debt, particularly with the slow rise of U.S. interest rates and the move of finance towards the United States to take advantage of this shift. They were right. Argentina’s economy entered a spiral–the devaluation of the peso, the flight of capital from the country and then rolling inflation. Cambiemos created a crisis to solve a crisis. Macri promised to make Argentina the ‘supermarket of the world’. He said that foreign investment would flood the country, while Argentinian goods would be found everywhere. None of this occurred. Liberalisation and deregulation led to an increase in imports rather than in exports, to a decrease in the profits of foreign businesses and to capital flight–producing one of the largest private-sector deficits in the country’s history. Argentina found itself more and more suffocated by outside forces in these first two years of Macri’s government. Macri’s policies trapped him, preventing him from using tools–such as capital controls–that would have given Argentina some independence. A decrease in the Central Bank reserves. Containment of fears of devaluation. The flight of capital by providing enough dollars to cover the fiscal deficit. Between 2016 and 2017, Argentina’s external debt increased substantially, reaching 53% of Gross Domestic Production (GDP). This debt to GDP ratio threatened the stability of the economy. In April 2018, the Federal Reserve Bank in the United States raised interest rates. Dollars began to drift back to the U.S. from across the world, notably from middle-income countries such as Argentina and Turkey. The Argentinian Central Bank tried to intervene to stem the haemorrhaging currency, but found it had insufficient tools to do so (by putting capital controls aside, for instance). In May, Macri’s government welcomed the IMF to take over. But the crisis was not the result of an ‘external storm’, as Macri’s government said. The rise of U.S. interest rates was the spur of the crisis. But it was Argentina’s government–under Macri–that had put the country in a position of dependency to the U.S. currency, whose rise was merely the trigger for an explosive situation already shaped by Macri’s policies and by the structural problems of the world capitalist system. The intervention of the IMF was not merely technical. It was a political intervention to defend a government in trouble and to set the stage for deepened economic transformation, not only in Argentina but also in the region as a whole. Nothing that the IMF suggested was alien to Macri’s government. Before the IMF intervention, Minister of Finance Nicolás Dujovne already announced the reduction of public spending on infrastructure. The IMF ‘reforms’ simply mirrored the neo-liberal agenda of Macri, an agenda that the oligarchy and the IMF would like to impose across Latin America. In June 2018, the IMF and Argentina agreed to an initial Stand-By Arrangement that promised to provide US$50 billion over 36 months in exchange for an economic plan that would reduce the primary deficit to zero by 2020 and strengthen the ‘autonomy’ of the Central Bank. The ‘autonomy’ of the Bank in these negotiations often means that there should be limited democratic oversight of the Bank’s decisions, that the Bank’s neo-liberal policies should be seen as merely technical policies and that the Bank’s primary mission should be to control inflation rather than worry about unemployment. A few months into the Arrangement, a new currency crisis unfolded. By the end of August, the peso had devalued dramatically (by 15% in one day), the interest rate had risen to 60% and the country risk (as developed by JP Morgan) reached a high of 780. The Macri government sought a second Arrangement with the IMF to stop the bleeding. The IMF hastened the transfer of the funds so that the money would come into Argentina during Macri’s term in office (which ends in late 2019). The government agreed to erase the fiscal deficit by 2019 rather than by 2020 and agreed to provide a surplus of 1% of GDP. The implication here is that the government will drastically reduce money supply to control inflation. Economic Minister Nicolas Dujovne’s deputy Guido Sandleris became the head of the Central Bank–both men with a keen interest in Argentina’s return to the IMF and to the orthodoxy of neo-liberalism. Deep cuts were suggested for the Ministry of Health and Work–one of many institutions key to Kirschner’s redistributionist policies. Argentina has signed several agreements with the IMF–three Stand-By Arrangements in the 1980s, two in the 1990s (and two Extended Fund Facility arrangements), one in 2001 and another in 2003. Each of these Arrangements repeat the same grammar. Any fiscal problem is blamed on elevated public spending, which leads to increased consumer demand, which leads to inflation. To access IMF assistance, the government is told to cut public spending to decrease debt as a core part of the structural adjustment plan of the IMF. The cuts are not merely technical but are fundamentally about the politics of the country. The government’s 2019 budget asks for the evisceration of social policies and cuts in subsidies for crucial aspects of social life, such as health and education. At the same time, the government has set aside funds to pay down debt. More money is to go to the bankers and less money to the population–this is a political intervention as much as an economic one. Structural adjustment is a well-known policy framework of the IMF. Over the course of the past few decades, it has been utilised across the Global South. The prescription of structural adjustment leads to the same problems: strangled economic activity, decrease in public funds, deeper recession, increased unemployment, job insecurity and poverty. The kind of policy pushed by the IMF and adopted by the Macri government leads to a situation of Permanent Structural Adjustment–a deeper crisis produced by the IMF’s solutions to the crisis, which encourages even more solutions that in turn further the crisis, continuing the downward spiral and strengthening the economic and political intervention that impedes the country’s ability to make sovereign decisions that are not driven by a commitment to repay escalating its ever-growing debt. This is the current situation in countries wracked by IMF polices, from Argentina to Greece (Katz, 2018). Crisis Amongst the Dominant Sectors. Capital is not a homogenous bloc. It is fractured along various lines, with some sectors (such as high finance) in contradiction at certain times with other sectors (such as construction). Different fractions of capital are able to exert themselves into the political domain and to become dominant as a result of their monopoly power and their political activities. After the 2001 economic crisis, the industrial sectors won a privileged position. Sectors of high finance and privatised service sectors found themselves relatively side-lined in the political sphere even as they continued to have a central economic role (Schorr, 2018). Over the course of the Kirchner era, the monopoly fractions of high finance and sections of agri-business built the ramparts of a challenge to neo-developmentalism, the policy framework of Argentina’s progressives. These fractions of monopoly capital succeeded in imposing an agenda on the other fractions of capital that included the reduction of costs–especially salaries–and better conditions for capital with the reduction of regulations and the sale of profitable parts of the public sector. The main political goal of this assertion was to eradicate the heritage and power of the Argentinian progressives and the legacy of Peronism, and exchange it with the politics of high finance and sections of agri-business (López, 2018). By the early years of this decade, Argentinian progressivism–Kirchnerism in its current phase–suffered important setbacks produced by the international climate and by the contradictions of Argentinian capitalism. The rise of inflation impeded the progressive redistribution of income. 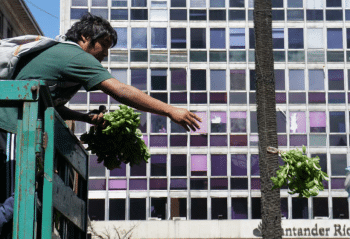 The reappearance of fiscal deficits and the virtual stagnation of GDP provided the openings for the bloc of the monopoly sections of high finance and sections of agri-business to make an assault on the ramparts of the Argentinian progressive movements and agenda (López and Cantamutto, 2018). When Cambiemos came to power, they put forward a model for growth that is fallacious. It assumes that changes in Argentina’s regulations will draw in Foreign Direct Investment (FDI), although FDI is fickle, controlled by domestic interest rates and the interest rate of the U.S. Federal Reserve. Everything that Cambiemos and Macri did was to strengthen the power of their core allies (high finance and sections of agri-business) rather than to produce the conditions for growth in Argentina. The devaluation of the peso, structural adjustment of tariffs, liberalisation of currency controls and the increase in interest rates quadrupled the profits taken in by banks and by speculative transnational capital. The embezzlement of the state coffers at this scale has been seen only during the years of the military dictatorship (1976-1983). High finance gained major advantages. Small and medium investors–deluded by their identity with high finance–saw gains to their portfolio and remained in support of a government that is hollowing out the remains of Argentinian democracy. Sectors of capital–such as medium and small-scale industry–made noises about Macri’s policies. But, the power of these sectors is limited. They eventually supported Macri, even as his policies undercut their businesses. The power of high finance and its associated sectors–including agri-business–overwhelmed the other sectors of capital. There was a perception that the hegemony of high finance is absolute, its policy framework inescapable. Contradictions within capital, however, remained alive. When the IMF pushed the agenda to increase taxes on exports and taxes on personal goods as a way to improve the harvest of tax revenue and reduce Argentina’s external debt, sections of the agri-export bloc resisted. This bloc was able to force the government to pause these reforms and then to end them. However, tensions inside the bloc of capital have not manifested themselves in public. The hegemony of high finance and the role of the IMF have suffocated not only the government of Macri but also the subordinated sections of capital that do not feel powerful enough to launch an inter-bourgeois bid for power. Drift is the order of the day. It should not surprise anyone that Larry Kudlow, the Director of the National Economic Council in the United States, should propose to link the peso to the dollar as a solution to Argentina’s crisis. This solution–tried between 1991 and 2002–and an even more radical solution–to dollarize Argentina–are being discussed as an antidote to hyperinflation and to stimulate growth. As people take to the streets with their own vision for a solution and as the inter-capitalist bloc hesitates to offer its own views, external forces (the IMF, the U.S. government) drive a dynamic through a willing Macri government. To clear the ground for Argentina’s approach to the IMF, Cambiemos and Macri had to destroy the legitimacy of redistributionist policies and of Kirchner’s politics. The main theme for this assault was the ‘wastefulness of populism’, namely the assertion that the previous Kirchner administrations had wasted public funds on inefficient policies and had promoted a culture of laziness rather than a culture of entrepreneurism (Murillo, 2018a). This attack on ideas of social redistribution and on ideas of socialism is part of a global and regional assault. This attack has been conducted by monopoly multimedia firms as well as by the interventions in social media by political forces (Ceceña, 2013; Boron, 2012; Korybko, 2018). The twin of waste is corruption. Campaigns against corruption are a strong means to undermine the legitimacy of the left and of the populists. The ‘Notebook Scandal’ of 2018 in Argentina mimics that of the ‘Car Wash’ scandal in Brazil that undermined Lula and the Workers’ Party. The ‘Notebook Scandal’ alleged that local businessmen paid bribes to government officials in the Kirchner government. The allegations go all the way up to former President Cristina Fernández de Kirchner, who is currently being threatened with pre-trial detention. The script used against Lula has been brought out in Argentina. Corruption and waste have a long history in Argentina. Senior members of Macri’s government are accused of similar crimes. But, the anti-corruption campaign in today’s Argentina, as in today’s Brazil, is not intended to go after corruption or waste. Its purpose appears to be to undermine institutions of democracy, to reduce people’s faith in government in general and to point an accusatory finger at the entire populist and left bloc while ignoring the accusations against the right and centre-right. The corruption campaigns, in other words, are used for political rather than policy purposes. This is a political intervention masquerading as economic policy. A new process–Lawfare–has been utilised to subordinate politics to the judiciary. Old cases against the perpetuators of crimes against humanity during the period of the dictatorship have been either dropped or halted. By presidential decree (as recommended by the U.S. government), the armed forces are now given permission to intervene in domestic affairs, a policy that overturns the checks put in place after the military dictatorship had been overthrown. The crimes of the armed forces then and the possibility that the armed forces will conduct crimes now is not central to discussions of criminality and lawlessness. As part of the process of ‘lawfare’, the police are given carte blanche to act against social unrest (the government wants to remove the law that prevents the armed forces from acting against protests). Police repression against the Mapuche people in Argentina’s south that cost the lives of Santiago Maldonado and Rafael Nahuel and against the working people and the poor people of Argentina’s cities is not seen as lawless. Police repression is seen as the law while democratic activity is becoming increasingly portrayed as lawlessness. The other side of Lawfare is the use of the mechanisms of the judicial system to persecute anyone that the State sees as a political threat. Judicial cases are brought against these people, who are then arrested and held without bail and without a trial and a sentence. This pre-trial detention allows the State to disappear political threats to the neo-liberal order. This is what occurred in Brazil with the incarceration of Lula and it is what the Argentinian oligarchy would like to see with an imprisonment of Cristina Fernández de Kirchner. The State and monopoly capitalists drive their agenda forward while side-lining their opponents using the techniques of Lawfare. Senior leaders are threatened with prison, while protesters are threatened with police violence. This weakens democratic institutions. The characteristics of the current neo-liberal offensive that have emerged include violence, authoritarianism and undemocratic forms of security and surveillance (Boron, 2003; Quijano, 2000; Murillo, 2018b). Neither the persecution of the senior leadership of the progressive political formations through Lawfare nor the attacks against the popular movements are able to silence opposition to the government and to the IMF policies. The worsening of the economic and social crisis has led to the government’s declining popularity, which today has reached about a third of the population. The pattern of decreased social and political support for the government has not meant the growth of organised resistance to the Macri regime. Instead, the decreased support has led to tensions and conflicts and the re-arrangement of institutions and political forces. It has also generated disillusionment. Focus is on the presidential election of October 2019. If Macri cannot develop a broader support base and if social unrest continues, then a political crisis will no doubt erupt. What the ruling class will do is to be seen. What is already visible, however, is that social unrest has increased throughout 2018. The character of this unrest is yet to be clarified. The energy is to defend the gains of the past and to prevent the further deterioration of society. Across Latin America, there is a desire to build a response to the crisis of neo-liberalism that is rooted in social solidarity, direct democracy and policies that expand the control of people over their economy. Neither the economic crisis nor the intensification of political repression should make us lose sight of the popular mobilisations that have carried important weight for Argentinian society. From 2016 onwards, there have been very significant, large demonstrations. There have been four general strikes with the participation of the major trade unions in the country. There has been an immense mobilisation of women over questions of labour and abortion. These mobilisations–over a range of issues–have filled the streets of Argentina’s cities, notably Buenos Aires. The various struggles in the streets is one way to gauge the depth of popular dissatisfaction amongst the key classes and groups. These protests, however, have not created a new electoral-political bloc that could channel the dissatisfaction of the people into the October election. 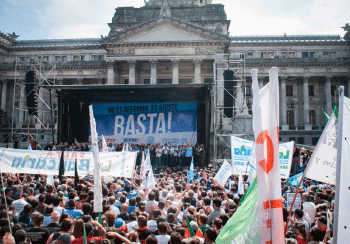 Power in the streets as well as strong labour and social organisations could define the direction of Argentina. But political fragmentation weakens the ability of the people to produce an alternative to Macri and the IMF. On 25 September 2018, the General Confederation of Labour (CGT) called for the second general strike of 2018–the fourth such strike since 2016. Workers and allied social groups joined the strike in large numbers. This strike provided a platform for the opposition to structural adjustment policies that increased debt and social hierarchy as well as for the unions to demand a renegotiation of salaries. Branches of the Argentine Workers’ Central Union (CTA) and the members of the Federation of Workers of the Popular Economy (CTEP) converged, which meant that formal and informal sector workers struggled together in this process. Trade unions play a major role in Argentina, where the rate of union membership is 37% (as opposed to an average of 25% across Latin America). But these unions have not always worked together. 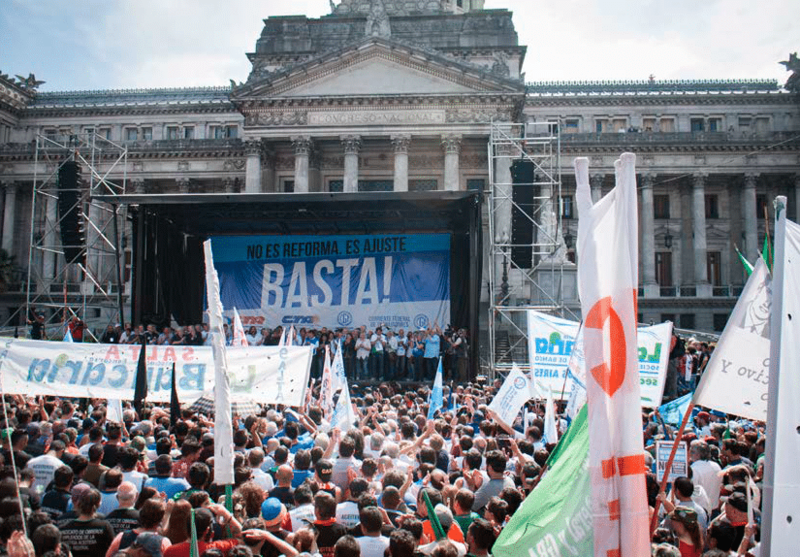 The three most important trade union federations in Argentina came together during the strike, overcoming decades of fragmentation in the union movement. These union groupings–CGT, CTA and CTEP–represent different sectors of the economy and have different political outlooks regarding trade unionism and capitalism as well as regarding socialism and Peronism. The CTA is further divided into three factions. Although none of these unions supported the Cambiemos economic model, they responded to it with different sensibilities–some with silence, others with open confrontation, some with conciliation and others with non-cooperation. Their unity now is of considerable significance. Jorge Duarte, an expert on labour issues, argues that the labour movement is more combative in the interior of the country. In the industrial areas in Cordoba, Santa Fe and greater Buenos Aires, the growing waves of layoffs and factory closures have led to massive mobilisations and road-blockades. For example, over five months three thousand metal workers lost their jobs, while ten thousand of their comrades found themselves temporarily out of work. In Córdoba, four thousand autoworkers have been suspended from their jobs. Whether those who have been suspended will be re-hired is not the issue. The issue is that they have no way to earn money at this time. Such a situation has provoked labour unity and forced trade unions to collaborate with each other. This dynamic from below has pressured the trade union national leadership to abandon its policy of dialogue with the government for a new policy of confrontation with the government. The CGT has now adopted a confrontational policy, drawn into the struggle by the Truckers’ Union and the Federal Workers Current. They have launched a Labour Coalition for a National Model, whose slogan is the country is in danger. This front has emerged as an important mechanism to channel the energy of street resistance into the 2019 elections. Over the course of the second half of 2018, Argentina’s politics has been defined by the mobilisations of various labour groups. Most of them come to the streets to protest the desiccation of the State and failure to move salary negotiations forward in a time of inflation. In August, university professors led a struggle for wage increases and for an increase in the university budgets. Students joined that fight, organising occupations in more than ten universities across the country. Teachers’ unions and education workers staged an extended series of conflicts and mobilisations, particularly in the province of Buenos Aires. Doctors and health workers held protests against the evisceration of health care. They organised a national march in defence of the right to health care. In addition, important struggles took place by public administration workers against layoffs and against structural adjustment policies. 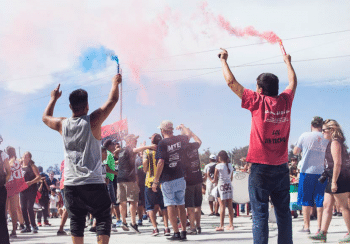 To create a full picture of the labour unrest in Argentina, it is important to bring in the third actor: the movement of the excluded workers. These are workers who are excluded from the formal economy–informal sector workers who are outside the legal frameworks and are dispossessed of any access to labour rights. Since 2010, these workers have been organised under the CTEP, which some have called ‘the CGT of excluded workers’. The movement of excluded workers is an illustration of how the working class has been fragmented and reorganised by neo-liberal policies. In 2018 the excluded workers seemed to be constantly on the streets, not merely through CTEP but also its main allies. 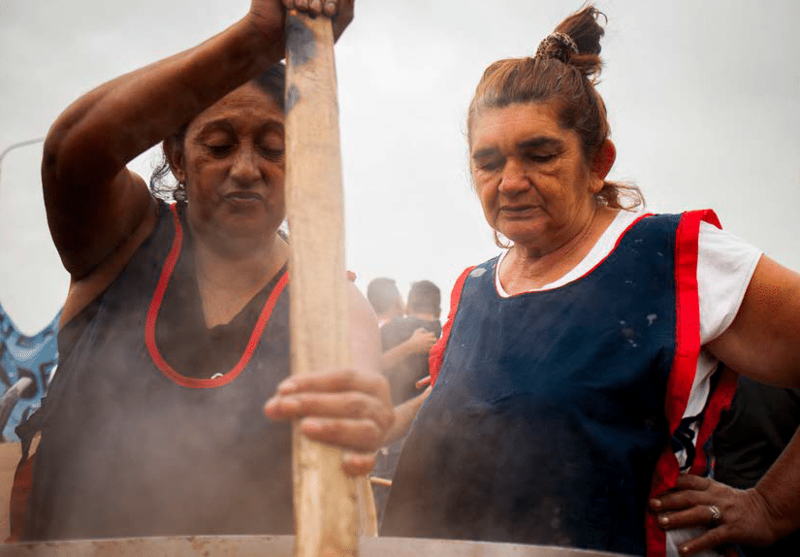 CTEP has not only driven an agenda based on its programme, but it has made it a priority to deepen alliances with fraternal groups–such as La Corriente Clasista y Combativa and Barrios de Pie. These three groups are known as the Trident of San Cayetano for the 8 August demonstration that they organised on the Day of San Cayetano. Their demands for Land, Work and Housing struck a chord not only amongst the excluded workers, but across the key classes. The struggles of CTEP and its allies won major victories, including an increase in social wages and a renewed discussion about the importance of recycling (an activity conducted largely by excluded workers). The most important victory, however, was not economic but political–the increased collaboration between CTEP and CGT as well as important public discussions about the role of unions and electoral politics as well as the limitations of Cambiemos’ economic policies and of neo-liberalism in general. The struggles of 2018 cannot be fully grasped without taking into account the struggles led by the feminist organisations. Since 3 June 2015, the feminist movement and the women’s movement has grown at a massive rate. The slogan ‘Not One Less’ (Ni Una Menos) emerged to define the repudiation of chauvinist violence in the country. In October 2016, women led the first general strike against Macri’s government. The event grew into an International Women’s Strike. Women in 200 cities across the world participated in this strike. Much of 2018 has been defined by the struggle to legalise abortion which, on the night of 8 August, led to the gathering of two million people in the streets of Buenos Aires (the population of Argentina is 44 million and that of its capital, Buenos Aires, is three million). These protests created a massive social shift in the country. They changed the perception of chauvinist violence, gender inequality and women’s rights to make decisions about their bodies and their desires. The leaders of this struggle are, without a doubt, young people (even adolescents); Luciana Peker, a journalist and author of the highly influential La revolución de las Mujeres no era una pildora, called them the ‘revolution of daughters’ (2017). A new ‘feminist wave’ has emerged, with international solidarity and international strikes as its key characteristics. The other aspect of this new feminist wave (defined by the #MeToo and #NotHim campaigns) is that it places neo-liberal governments and conservative forces as their main adversaries. 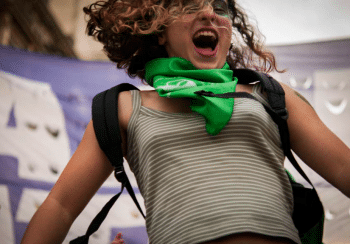 In Argentina, in addition to the youth, the women’s movement includes workers who have helped grow this massive and heterogenous social and political movement. Within this movement there are a variety of political strategies and currents. Each of these is in open dialogue with the others on how to translate their power into politics, and then politics into policy. The crisis in Argentina remains alive. The most optimistic economic forecast suggests that the inflation rate will slowly decrease as a result of the contraction of the economy. This recession will last into the second trimester of next year. Others suggest that the anti-inflationary policies have limits, mainly with respect to the cost of services and goods that have prices fixed in monopoly markets. Only a political intervention to secure the re-election of Macri might tilt the hands of those who control these monopoly markets to reduce prices. Even more chilling for the neo-liberal managers is the possibility that Argentina–now more vulnerable to external shocks–will see its currency deteriorate further as interest rates rise in the United States or as other mechanisms lead to the erosion of Argentina’s peso. Any such external shock or a continued rise in inflation and a deepening of the recession would impact the October 2019 elections. Despite the protests and the decline of support, Macri was able to push through his budget in the Chamber of Deputies. This budget is based on commitments made to the IMF that propose a reduction in social public spending with the aim to achieve ‘zero deficit’. Protestors surrounded the Chamber. The State sent out its police to violently push away the demonstrations. Images from that repression mirrored the police violence of 2017 during the vote to reform the pension system. 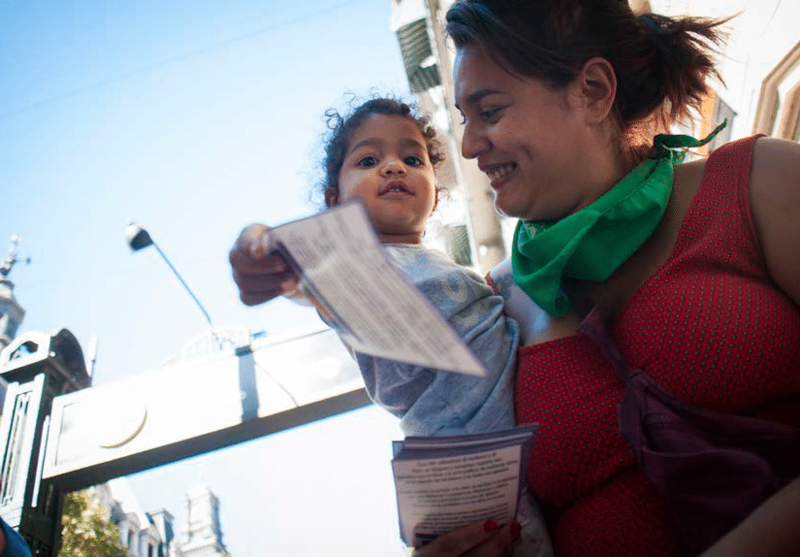 Argentina’s future will be shaped by the actions of the people and their various organisations and movements. If the social unrest increases in response to the inflation and the recession, then this might translate into broad social and political protest. In the context of the crisis of the second half of 2018, social unrest did intensify as did political protest. The social protests put some limits on government policy, but they were not able to block the application of the most severe structural adjustment policies. What has not emerged is a unified force that represents a clear opposition to the neo-liberal policies that are hollowing out Argentina. Nor is there a clear electoral strategy that has the capacity to challenge the government at the polls. These are limitations that need to be closely followed in the next few months. The structural transformations brought about by the neo-liberal policies of Macri’s government–especially the extreme levels of external indebtedness–will have consequences that reach far beyond the presidential election of October 2019. 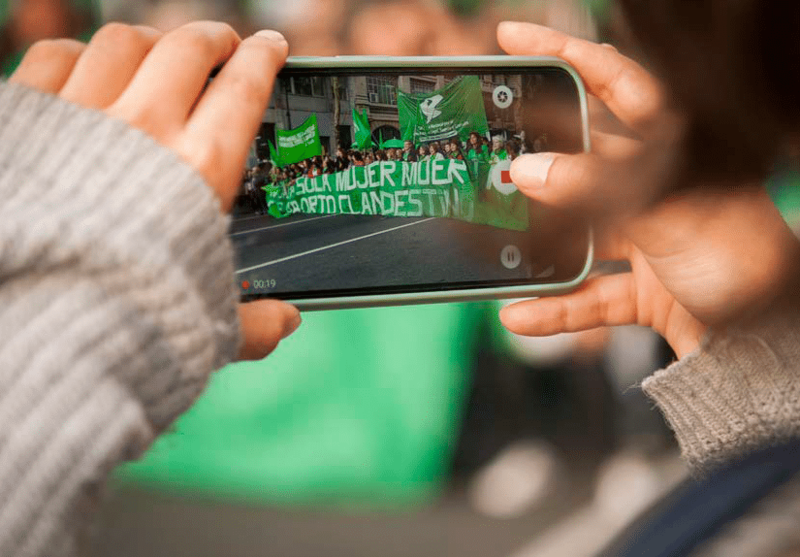 What the neo-liberalism of Cambiemos produces will provide a severe challenge not only to social life, but also to the political possibilities of the people–and so, to the popular movements of the Left. The development of the neo-liberal offensive on a regional and global level seems to highlight the close relationship between the concentration of wealth and the deterioration of the quality of life for the vast majority of Argentinians. This also highlights the deterioration of democracy and liberal law towards the rule of authoritarianism–towards the military and socially violent regimes. The urgency to defend democratic life and human dignity underscores the need to radically deepen the forces of emancipation and the horizon of an emancipated society. Belloni, Paula y Wainer, Andrés (2018). ¿Lo que el viento se llevó? La restricción externa en el kirchnerismo. En Schorr, Martín (comp.). Entre la décadaganada y la década perdida. La argentina kirchnerista. Estudios de economía política. Buenos Aires: Editorial Batalla de Ideas. Boron, Atilio (2003). Estado, capitalismo y democracia en América Latina. Buenos Aires: Clacso. Boron, Atilio (2003). América Latina en la geopolítica del imperialismo. Buenos Aires: Ed. Luxemburg. Korybko, Andrew (2018).Guerras híbridas–das revoluções coloridas aos golpes. São Paulo: Expressão Popular. López, Emiliano (2018). Qué fue de la hegemonía desarrollista? Tiempos de transición y nuevasposiciones al interior del bloque de poderen Argentina. Cuadernos de Economía Crítica; Vol. 4, Nro 8, 15 – 41. López, Emiliano y Cantamutto, Francisco (2018). El orden social kirchnerista entre la economía y la política. En Schorr, Martín (comp.) Entre la décadaganada y la década perdida. La Argentina kirchnerista. Estudios de economíapolítica. Buenos Aires: Editorial Batalla de Ideas. Murillo, Susana (2018a) “Construcción de hegemonía y procesos de subjetivaciónen el arte de gobierno neoliberal”. En Guido Galafassi y Florencia Ferrari (Compiladores) Disputas, Hegemonía y Subjetividad, Ranelagh: Extramuros Ediciones, Theomai, GEACH. Murillo, Susana (2018b) “Democracia, neoliberalismo y estado de Excepción”. En: Melisa Campana y José G. Giavedoni (Comps.) Estado, gobierno y gubernamentalidad. Neoliberalismo y Estado de excepción en Nuestramérica. Rosario: Pegues. Peker, Luciana (2017) La revolución de las mujeres. Villa María: EDUVIM. Schorr, Martín (2018). Entre la décadaganada y la décadaperdida. La Argentina kirchnerista. Buenos Aires: Editorial Batalla de Ideas.